I was invited, and very much looking forward to, a wedding this evening. However, my body had other plans. After a week and a half of not feeling well I finally dragged myself in to the doctor’s office today and left with a prescription for some strong antibiotics, as well as a medium-sized dose of self-pity. It’s very cold outside, and that cold seems to have seeped into my very bones tonight. Oh well, I thought, if I can’t be at the wedding of my two friends, at least ‘The Grinch” is coming on and I can enjoy that. Imagine my disappointment when, instead of the animated 1960’s television classic, the opening credits to the modern-day theatrical release blared from my TV screen. Not that there’s anything wrong with the movie, I guess. It just is not what I was expecting, and not what I wanted. Hence this blog post. This time of year finds me revisiting Christmases of my childhood, youth, early marriage…ghosts of Christmas past, I suppose, the circle of years. I remember kid-Christmases with Reed and our cousins at our house on Ford Street and their house on Arnold Street, when dolls and teddy bears and toy trucks were the things our fondest little dreams were made of. I still have my last Christmas present from Granny before she died, a little black and white panda bear. It has a music box inside it that used to play “Frere Jacques”, but the winding key was lost decades ago. Later Christmases on Ford Street, and then on Denwood after the bridge took the Ford Street house, included a big supper with lots of family coming and going on Christmas Eve, which was always when we opened presents and had our gathering. Mamaw and Papaw would be there, after Dad or Reed would go and pick them up. Mamaw and Papaw were homebodies and often huffed and puffed about coming over, but they always had a wonderful time once they were there. One year I remember we all got watches for Christmas, Mamaw and Papaw included. Often Aunt Ruby and Aunt Martha spent the evening with us as well, contributing something to the dinner table and providing lots of love and laughs. A highlight for me was always after supper and presents, when we’d gather around the piano and sing. Mama always played beautifully and sang alto, and the rest of us harmonized on familiar Christmas carols and old-timey songs out the hymnbooks that are in my collection now. Aunt Martha singing “Ivory Palaces” echoes in my soul to this day, her sweet soprano drifting through the recesses of my memory. 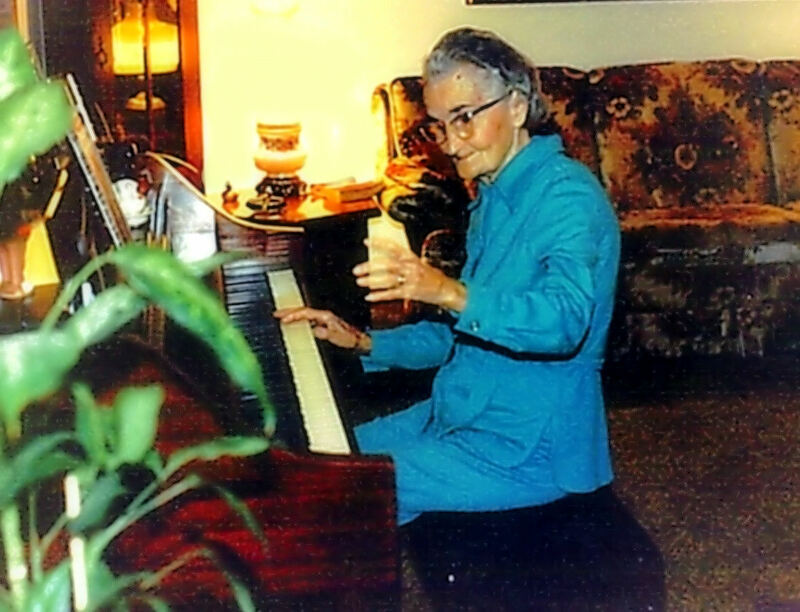 For a large part of my life, I was unaware that my Mamaw played both piano and organ. Once she asked Mama if she could play the piano, and Mama said, “Why, sure, Mamaw, play it all you want!” And she did, like a house afire! This side of Mamaw was a revelation to me, and what a kick we all got from seeing and hearing her play with such vigor and pleasure. 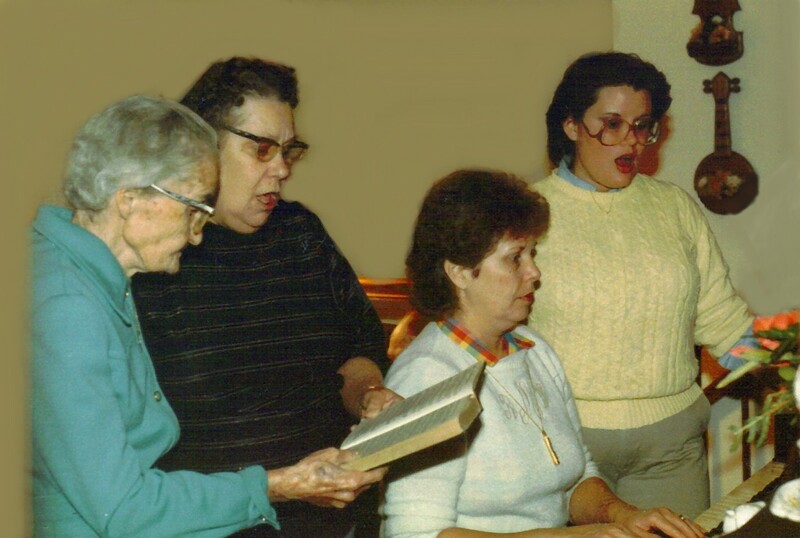 Papaw enjoyed our musical holiday tradition as well, often adding his voice to the female chorus. Dad would usually sit reading quietly, and Reed generally took the pictures, including, I believe, the second and third ones posted here. He was a photographer from a very young age. Some of my Christmas gifts have been memorable, like the “watch” Christmas, and the year Granny gave me the musical panda bear. One year Mama and Dad gave me my “hope chest”, a lovely cedar box with its natural striated red and golden grain left showing, a gift which made me weep with joy. The year Jeff proposed and gave me my ring and the first place setting of our good china was a milestone Christmas, as was our first married Christmas when all I asked for was a good winter coat (which I still own and can once again fit into!). Some years the gifts were quickly outgrown or forgotten. Some gifts, I am ashamed to admit, were disappointing to me. Looking at all the decades of Christmases, I realize that the true gifts did not come stowed under the tree wrapped in shiny paper. The true gifts came as we made circles. Circles around the supper table sharing food, laughter and well-worn family stories. Circles around the piano, blending voices in harmony as we sang other well-worn stories from out of the hymnbooks. Circles now incomplete down here because Mama, Mamaw and Papaw and The Aunts have gone to celebrate their Christmases in Heaven. I look forward to the day when in Paradise every day will be like Christmas…when once again our circle will be complete. Beautiful, truly beautiful. How funny you should post this today, when I put flowers on Mom’s grave, and went by Granny & Granddad’s and Aunt Mary’s and a few others. I miss Mom every day, and I know she knows that. Your post makes me remember and cherish Christmas Past. I think the only Christmas card I kept from Mammaw was the one that made me laugh the year she gave me a simple pair of socks with a card that said “I love you and hope you’ll keep your footsies warm.” Even today, I can feel her arms around me, and Aunt Mary’s and Aunt Martha’s and Aunt Elaine’s and Aunt Ruby’s. No words can accurately describe the way these women affected me, nor can words describe the cumulative loss I feel when think about them. 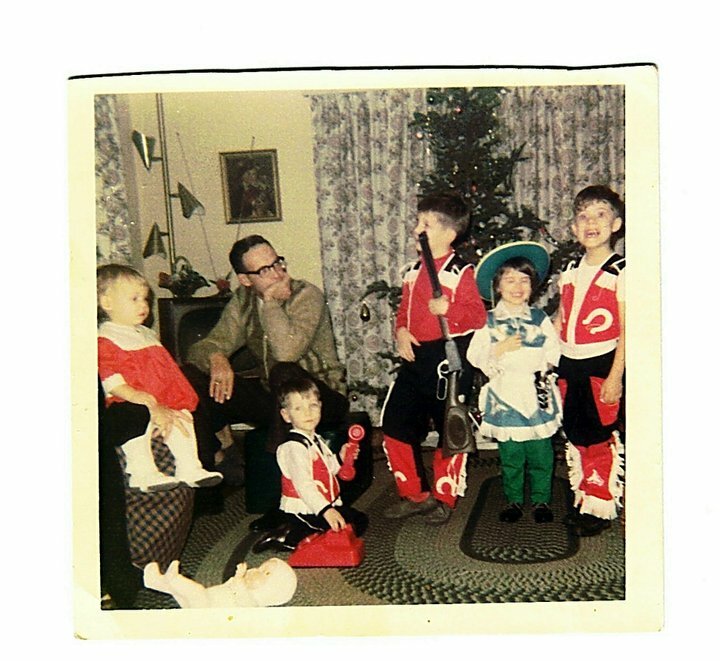 Our Christmases past were special, and I miss that — and all of them. Thank you so much, Reed. Thank you for your words, for the many pictures you took of our Christmases past, and for being the only other person on earth who has heard the beating of Robbie Jane’s heart from the inside.